Do you have some email accounts with pop3 & smtp service? Do you have pain of send big file with your email? 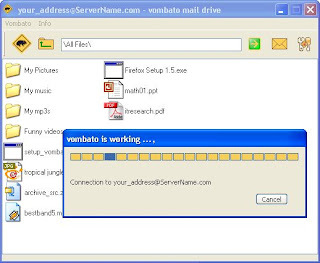 Ok, Vombato offers a software that allow you upload your file to your email account much easier than before, it call Vombato Mail Drive. After you download & setting, easy to use for sending file. It works any pop3/smtp email service, but it is not free software, you need pay license after used 21 days.